-KEEPiN' UP WiTH THE JONES'-: Wow! My Struggle With PCOS! A friend forwarded me a blog today and I read through it and found this quote. I think sometimes we think that we always have to be so perfectly put together. But, in reality we don't. I am on our yearly family vacation having a much needed relaxing week. Unfortunately I found out on Wednesday that we are once again, not pregnant. There have been many moments where I have just wanted to break down into really really ugly cries, but have tried to hold myself together. Today, along came another pregnancy announcement and I just couldn't do it any more. I needed to let it all out. 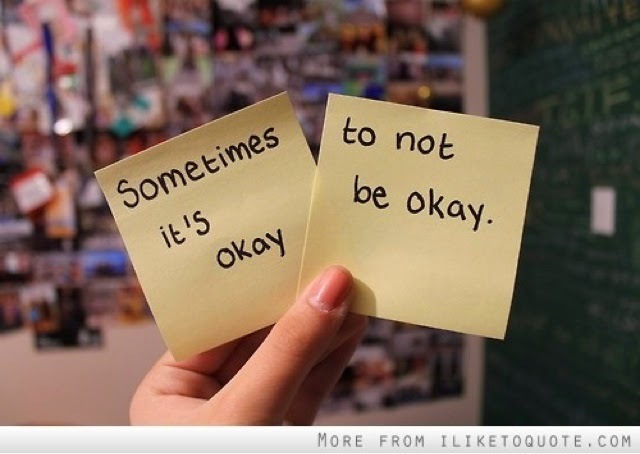 Then I read that quote and realized...sometimes it's okay to not be okay! So right now, I'm not okay. I won't let the pressure of holding myself together push me down any farther either. I have ever right to me upset, be sad, be devastaed. But I don't have the right to live in that state. That sounds like a good plan. Do sadness and then do other things. No point wasting our beautiful lives in being forever sad. I liked this post.